The musculus triceps brachii belongs to the arm muscles. It covers the entire backside of the upper arm and is involved in almost all arm motions. 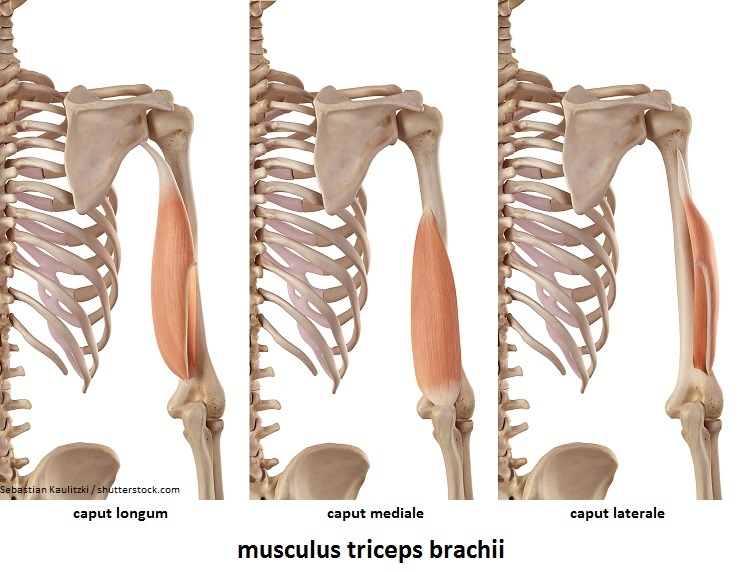 The musculus triceps brachii consists of three heads, one long head (caput longum) and two short heads (caput mediale and caput laterale). The long head originates from the small knob below the shoulder socket at the shoulder blade (tuberculum infraglenoidale scapulae). The two short heads have their origin on the back of the humerus. All three heads insert into the elbow (olecranon). The musculus triceps brachii (all three heads) extends the elbow joint. Additionally, the long head pulls the arm laterally toward the body (adduction) and moves it toward the back (retroversion). The musculus triceps brachii as the only elbow extensor is involved in almost all movements of the arm. Especially in gymnastics, strength training, throwing and batting disciplines, or boxing the three-headed muscle of the upper arm is essential. But also from a body forming perspective the triceps catches a lot of interest.